Most people don't realise what they do when they smash a fly to pieces against the wall. They think it is an annoying little critter and they are right. But they often don't know what they destroy. The fly is a masterpiece of evolutionary design. Next time when you see a fly hovering around your room try to catch it. With a good hand lens there are many features to explore. When observed with a microscope the true marvel of the 'ultimate machine' is seen. The following pages will show you why the fly is such a special creature. Apart from a portrait of it's intriguing head you can see many interesting features in three dimensions. 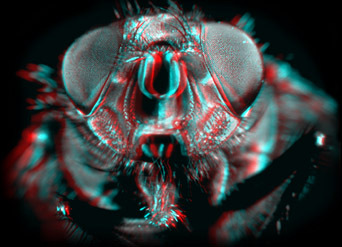 The images should be observed with red and blue anaglyph glasses. Published in the February 1999 edition of Micscape Magazine.